Southern California hot rodders have been looking for an as-yet-unexploited advantage, whether it be in engine building, technology, or aerodynamic efficiency. Dean Moon’s aerodynamic wheel covers were popular with land speed racers, drag racers, and hot rodders throughout the 1950s and well beyond. While the so-called Moon discs are still popular with the vintage hot rod crowd, and surprisingly has a garnered a huge cult following in Japan, there are not many who use them on modern cars. The idea of using full wheel covers for aerodynamic efficiency and improved fuel mileage or EV range has largely been a fringe idea. Dean Moon’s company, Mooneyes, was founded in 1950 and continues to operate out of a shop in SoCal. 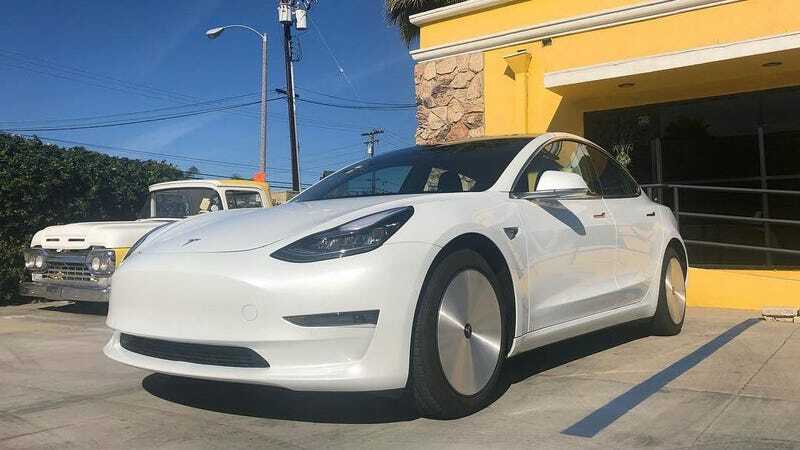 The company recently posted a photo of its new “toy” Tesla Model 3. It appears the car has been lowered quite agressively, and has been fitted with modern moon discs. Not only does it look an absolute banger, but there is some benefit here in making the car more efficient. Tesla has already admitted that its own aerodynamic wheel covers can reduce aerodynamic drag by as much as 10%, which plays a huge part in the car’s effective range. By lowering the car its frontal area has been reduced, too. While these modifications will perhaps only gain the driver an extra few percentage points of range on a full charge, every little bit helps. Perhaps even more interesting is the effect that increased efficiency has on acceleration and speed. I wonder if these two minor changes might be worth a tenth in the quarter mile. Even if the Model 3 doesn’t post a better time at the track, it still looks pretty badass if you ask me.